Out-of-order speculative issue superscalar execution 8-stage pipeline giving 2.50 DMIPS/MHz/core. NEON SIMD instruction set extension performing up to 16 operations per instruction (optional). High performance VFPv3 floating point unit doubling the performance of previous ARM FPUs (optional). Thumb-2 instruction set encoding reduces the size of programs with little impact on performance. Jazelle DBX support for Java execution. Jazelle RCT for JIT compilation. Program Trace Macrocell and CoreSight Design Kit for non-intrusive tracing of instruction execution. L2 cache controller (0–4 MB). ARM states that the TSMC 40G hard macro implementation typically operating at 2 GHz; a single core (excluding caches) occupies less than 1.5 mm2 when designed in a TSMC 65 nanometer (nm) generic process and can be clocked at speeds over 1 GHz, consuming less than 250 mW per core. Samsung S5P4418 32bit 1GB DDR3 8GB on PC-T2 2 microSD ports 2.0 USB port/s RTL8211E on NanoPi-2 Fire, M2, PC-T2. 802.11b/g/n BT 4.0 Dual mode 40 RasberryPi compatible GPIO pins, UART, very small size and cost. Odroid Odroid-U3 Samsung Exynos 4412 2 GB eMMC module socket (non-standard), microSD 3×USB 2.0 host + micro-USB 2.0 device/host 10/100 Mbit/s Hardkernel has other product variants using the 4412. USB supports external Notebook harddrive with no external power. Preloaded emmc with Android and LUbuntu available. TOPIC Miami/Florida Xilinx xc7z030 1 GiB DDR3L 256Mb NOR 1Gb NAND microSD 2x (FPGA) USB 2.0 OTG 10/100/1000 Mbit/s 802.11b/g/n Single chip CPU/FPGA module. HDMI-in/out, PMOD, 4x serial. ^ "ARM Cortex-A9 MPCore". Arm.com. Retrieved 2012-02-02. ^ "Cortex-A9 Processor Specifications". ARM. ^ "White paper: The ARM Cortex-A9 Processors" (PDF). ARM. Archived from the original (PDF) on 17 November 2014. ^ "Cortex-A9 Single Core Processor". Arm.com. Retrieved 2012-02-02. ^ "ARM spins multicore-enabled Cortex core - News - Linux for Devices". Archived from the original on 6 September 2012. Retrieved 7 January 2010. ^ "BCM11311 - Persona ICE Application Processor". Broadcom. ^ a b "EnergyCore™ ECX-1000: Technical Specifications". Calxeda. Archived from the original on 25 April 2012. Retrieved 8 May 2012. ^ "High Performance, Dual-Core IP Set-top Box SoC". Entropic. ^ "Introducing the i.MX 6 Series". Freescale Semiconductor. ^ "HiSilicon Unveils Quad-Core Cortex A9 K3V2 Processor (Hi3620)". ^ Johnny Cullen (24 January 2011). "Sony outs tech specs for NGP". VG247. Retrieved 25 January 2011. ^ "Sony Playstation Vita Teardown & Product Analysis". TechInsights. Archived from the original on 18 August 2013. Retrieved 15 October 2013. 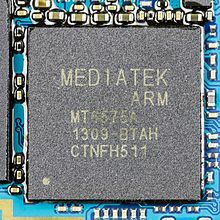 ^ a b "MediaTek - MT6575". MediaTek. Archived from the original on 15 January 2013. Retrieved 8 January 2013. ^ a b "MediaTek - MT6577". MediaTek. Archived from the original on 13 January 2013. Retrieved 8 January 2013. ^ Roy Rubenstein (9 October 2012). "An ARM based programmable processor is set to enable new communications products". ^ Kevin Trosian (8 January 2013). "Mindspeed to Showcase the Industry's First ARM Cortex A9-based Communications Processor with Integrated DPI at 2013 CES". 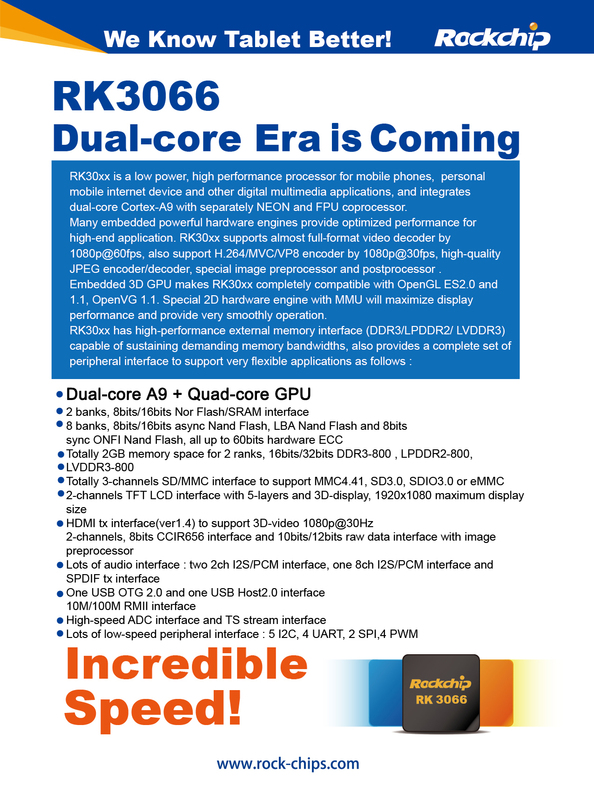 ^ "MACOM to Showcase Newly Acquired Mindspeed Comcerto 2000 System-on-Chip (SoC) Processors at the 2014 International CES". 7 January 2014. ^ "Computer System Chip". Nufront. Archived from the original on 30 August 2011. Retrieved 26 September 2011. ^ "Exynos 4210". samsung.com. 2012-01-20. Retrieved 2012-02-02. ^ a b "WonderMedia Announces PRIZM WM8950 with Android 4.0 Support". 19 May 2013. Retrieved 2013-06-17. ^ "EM3188 SBC". Boardcon Embedded Design. Retrieved 2018-04-09. ^ "EM4412 SBC". Boardcon Embedded Design. Retrieved 2018-04-09. Popular ARM Cortex-A9 MPCore & Multi-core processor videos, YouTube.